Pilate asked, "Why do you want me to kill him? What wrong has he done?" But all the people shouted louder, "Kill him on a cross!" Pilate saw that he could do nothing to make the people change. And he saw that the people were becoming upset. So Pilate took some water and washed his hands so that all the people could see. Then Pilate said, "I am not guilty of this man's death. You are the ones that are doing it!" All the people answered, "We will be responsible for his death. We accept for ourselves and for our children any punishment for his death." Then Pilate freed Barabbas. Pilate told some soldiers to beat Jesus with whips. Then Pilate gave Jesus to the soldiers to be killed on a cross. "Let it be on our heads!" Can you imagine anyone saying such a thing? Jesus' enemies are so intent on getting him crucified that they are willing to take full responsibility for rejecting and murdering Jesus. Of course, no matter what Pilate did, he could not absolve himself of guilt in this matter. 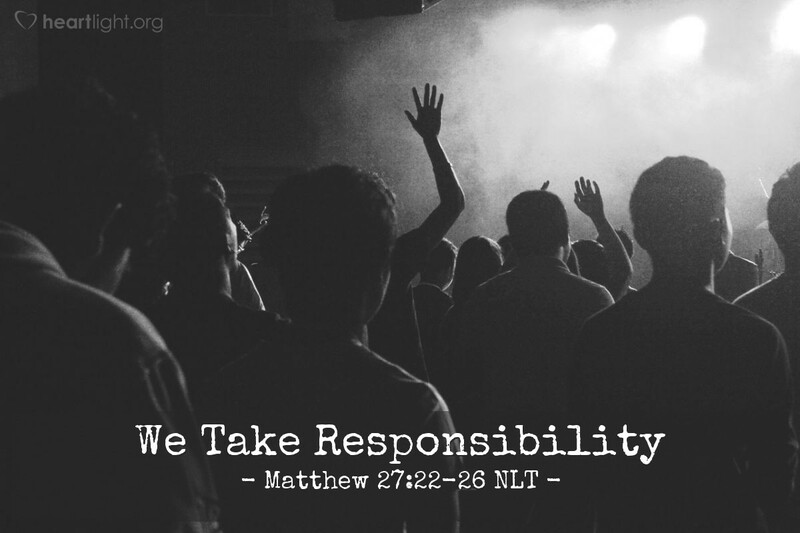 But even so, the incited crowd is only too glad to accept the responsibility of Jesus' blood on themselves. Incredibly, Jesus' death on the Cross was his way of taking our sin, our shame, and our guilt by shedding his blood to pay for it. Some of those who were calling for this horrible crucifixion would one day find forgiveness because this very blood was shed for them, too. Father, please forgive me; I often don't know what I'm doing. It's not always that I'm ignorant, but that I am sometimes weak and selfish, looking out only for my own interest. Please forgive me. I want to stand firm for my faith and be courageous in the face of bitter criticism. Thank you that Jesus died for my sins and help me to live victoriously acknowledging that Jesus saved me by his sacrifice. In Jesus' name I pray. Amen.